The defending champs Miami Heat are the absolute team to beat in the NBA today. Boasting the talents of Lebron James, Dwyane Wade, and Chris Bosh, Miami has embarked on a 27-game winning streak that was the second longest in NBA history. We’ll let that accomplishment speak for itself. The Milwaukee Bucks are actually a decent team, except they have the misfortune of facing the Heat in the first round. Larry Sanders is a good defensive big man, while Monta Ellis and Brandon Jennings are offensive threats. With a better seeding in the playoffs, this team might fare better in the future. Indiana boasts of the league’s best defense, with only 89.9 points allowed per game and 46.3 rebounds. With a solid frontcourt of Roy Hibbert, Paul George, and David West, they are a force to be reckoned with, even with resident star Danny Granger out for the season after injury. The Boston Celtics are quite depleted at the moment. All-Star point guard Rajon Rondo is out due to an ACL injury, while Kevin Garnett is on and off, battling recurring injuries of his own. This leaves only Paul Pierce as the big star to carry the team, and it’s not an easy task. The Knicks are riding on Carmelo Anthony’s scoring prowess and support from a band of veterans. After a good start to the regular season, the Knicks ran into some trouble later on and slid down the rankings a bit. They can put up a good fight, barring any further injury. The Bulls are facing uncertainty in this coming playoffs: Will Derrick Rose return in time for the playoffs? Without their All-Star guard, the Bulls have been a good defensive team but lack a lot on offense. IF Rose comes back, then they will have a bigger chance to win this round. Atlanta doesn’t boast of any really big names, but with balanced offense and defense plus good passing, they’ve reached the middle of the Eastern road. Josh Smith and Al Horford provide an interior presence and Jeff Teague is coming into his own as a point guard. Miami will continue to have a massive advantage coming into the second round. If they play like they did during the streak, then they will not have any significant problems dealing with the Nets. However, the opposition is also talented, so expect them to get a game (or two). The Pacers have been on a roll in the past two seasons. 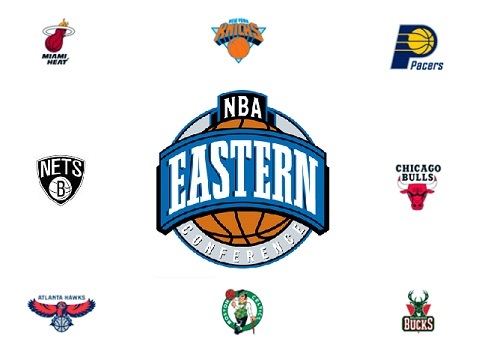 If last year they were considered a dark horse in the East, this year they’re legitimate contenders. Both Pacers and New York are considered defensive teams, but if the Knicks’ offense becomes overly reliant on Carmelo Anthony, then they will be on the losing end of the matchup. These two teams met in the second round last year, with Miami taking it in 6 games. However, both teams have improved greatly since then, despite not making any huge personnel changes. Expect a long and hard-fought battle between the two teams for the right to reach the NBA Finals.